We’d love your help. Let us know what’s wrong with this preview of A Curious Tale of the In-Between by Lauren DeStefano. Pram Bellamy is special — she can talk to ghosts. She doesn't have too many friends amongst the living, but that's all right. She has her books, she has her aunts, and she has her best friend, the ghostly Felix. Then Pram meets Clarence, a boy from school who has also lost a parent and is looking for answers. Together they arrive at the door of the mysterious Lady Savant, w Pram Bellamy is special — she can talk to ghosts. She doesn't have too many friends amongst the living, but that's all right. She has her books, she has her aunts, and she has her best friend, the ghostly Felix. To ask other readers questions about A Curious Tale of the In-Between, please sign up. Will my eight year old love it? Would this book be considered more of a Fantasy novel or a Mystery novel? (From the description it sounds as though it would be classified as Paranormal/Supernatural, but I'm trying to decide which section to put this in my library, and we don't have a paranormal/supernatural section). I would like to lock Lauren DeStefano in an attic so she does nothing other than turn out charming middle grade novels for the rest of her life. But I suppose that would be unreasonable. You'll love this book if the sad, tender pull between Liesl and Po tugged at your emotions, if you delighted in the dark humor and dire dangers of the Lemony Snicket series, or if you shivered ever so slightly at the delicious creepiness of The Cavendish Home for Boys and Girls. This book is so comfortably appro I would like to lock Lauren DeStefano in an attic so she does nothing other than turn out charming middle grade novels for the rest of her life. But I suppose that would be unreasonable. You'll love this book if the sad, tender pull between Liesl and Po tugged at your emotions, if you delighted in the dark humor and dire dangers of the Lemony Snicket series, or if you shivered ever so slightly at the delicious creepiness of The Cavendish Home for Boys and Girls. This book is so comfortably appropriate for children (though perhaps best read reassuringly curled up against a loved one, for both comfort and discussion of serious topics--parents might also consider reading it first before giving it to younger children), even as it doesn't shy away from intelligent use of language or touching on scary topics. The real world can be a sad, scary place, after all. The author's preface was also very moving--the idea of this young cousin of hers clutching a beloved book for security after a death in the family brought a tear to my eye. 3.5 stars. Oh, middle grade books. They can be so lovely, can’t they? They can enchant you, entertain you, make you smile or make you laugh. All of the above, perhaps. I didn’t know what I was to expect with this one. After all, Lauren DeStefano doesn’t write the most common of stories… which is something that I quite like about her. She’s full of ideas, that’s for sure. A Curious Tale of the In-Between is, indeed, a curious tale. It also reads like one. This novel reminded me of how I could never outgrow middle grade books. Sure, I don’t read them often, and I don’t like every one of them, but there’s something inside them that I don’t always get in young adult or adult books… something pure, charming and magic. But this story, it is also one readers can relate to and sympathize with its characters, especially Bram. Pram is looking for her father. Her mother died giving birth to her, and she’s convinced – likes to think – that her father does not even know she exists and that, when she finds him, he will help her discover herself a little more and better. When her aunts send her to school, she befriends Clarence whom is looking for the ghost of her mother… And, so, their paths are linked and, together, they will have to face dangers in order to find their lost love ones. I forgot to mention: Pram sees ghosts, an ability only a rare amount if people possess. Meaning, she’s valuable, and if her secret is discovered, she might not be safe anymore. I’ve always had this huge interest for ghosts. No wonder my favourite television series, when I was little, used to be Ghost Whisperer. I love the atmosphere ghosts/spirits bring to a story: slightly gloomy and oh so mysterious. A Curious Tale of the In-Between dared. It was borderline creepy at moments. Sometimes it didn’t even feel like a middle grade book, yet it was never scary. I think this has to do a lot with the maturity of the characters, because they were extremely so. Thank goodness. We need more characters like Pram and Clarence and Felix – her ghost friends – in books directed to a young audience. It is not true that every twelve, eleven, ten-year-old lacks maturity and jumps around all day. When I was twelve, like Bram, I was (and still am) very calm, a good listener and ponderer, and you would often see me quietly reading a book in some quiet corner. I connected to Pram. I connected so much to her. I’ve lost a family member, too, when I was a baby, so I could understand her struggles. Trust me, if you’re a reader of the middle grade genre or would like to try one, if you can’t stay away from family or ghost stories, or if you admire Lauren DeStefano peculiar yet enthralling stories, this is a novel I wouldn’t recommend you disregard. Not every adult is immature enough to enjoy a middle school book, but this one sounded intriguing on Netgalley and had such high reviews here I had to try for it. Plus, I'm rather immature. The 5 star rating reflects a children's book rating, so bear that in mind. For any age this is enjoyable, though, as the author has such a beautiful style of writing. It's like being sent back in time to English Gothic fiction but with a surreal, dreamy touch. Seriously, it's awesome. Her writing style is beautiful in its simple complexity, haunting in its theme. Not a simple story for a child by any means - there are layers of sadness touching upon different circumstances and stages of grief. Someone who never knew her parents, a person who just lost their mother to death, a child who died and can't remember what it felt like to be alive. Pram is a worthy heroine - imaginative, fun, compassionate - but not so to where it's simplified and cloying. Clarence is absolutely loveable and I can believe the sparks without the author having to paint the picture. Who couldn't love Felix? My anguish wondering about him was real when Pram herself worried. The supernatural in the mix isn't normal for this kind of work but works perfectly to convey how death is an inevitable force that is simply seen here as the next stage. Attempts are tried to reconnect with lost ones but I'll leave out the spoiler whether that works or not. If you have a child who wants to read, get them this. The imaginative world is craftily told in words that capture the mind as well as the story itself (and the possibility it opens) does. I feel really emotional right now. As a 23 year old I have only delt with death once. It is a new concept to me. I feel like I have been taught a special message through this book. I am really glad I read this! "Why must ghosts be so forgetful?" This middle grade book tugged at heartstrings I didn't know existed. I don't have much to say about this because it's such a short, quick read for me to give the book a longer review but if I have anything more to say at all, the words will only be sung in high praises. First of all - whoa, Lauren DeStefano really knows how to write a ghost story fit for young audiences. This story is in no way horrifying but yet it is still haunting and dark. I loved the gloomy atmospheric writing. It has a detached tone to it but still managed to touch the readers with its wistfulness. The premise is definitely something new to me. Our little heroine Pram short for - 'Pragmatic' came to the world hovering between life and death. She was cut out of her dead mother's belly and if that's not a gruesome way to be born I don't know what else could be. Pram grew up unique. She is brave, intellectual, inquisitive and she could see dead people and animals. I like how she doesn't come off as 'too special'. Her otherworldly ability only felt anything but natural, and I adore her charisma for others. “The living think the worst of death. But it isn’t a punishment. It’s just what comes next." I must say that I respect DeStefano for not romanticising Death, depression or suicide in any form of way. I'm especially intrigued that the ghosts here have their own backstories they don't remember, like how they met their Deaths and who they were in the life before. It definitely added more layers, piqued my curiosity and sympathy, and made the book all the more interesting. A Curious Tale of The In-Between is a fitting story for younger readers but anyone of any age can read this and easily enjoy it. It certainly touches on touchy subjects like mental illness but it never went too far beyond the non comfort zone. "Death isn't a punishment. It's just what comes next." First of all, I really liked the title of this book. That alone made me curious (heh); made me want to read this book. And gladly, I did. It may be a quick read but this book definitely won my heart. A Curious Tale of the In-Between, if you ask me, is a ghostly semi-adventure of friendship, longing, memories, acceptance, finding truths and moving on. It is not scary or creepy but it's still dark and haunting to say the least. It is a tale of Pram who has the ability to see and talk to ghosts, and her life as it unfolds to something more mysterious, terrifying and remarkable. This book is also about friendship; of a living (Pram) and a living (Clarence), and a living and a ghost (Felix). The dynamics in their friendship sends a pure happiness in my heart. There is a jealousy on the ghost side that made the friendship even sweeter, I caught myself smiling. Along with that, the genuity of the characters heightens up this strong point of the novel. The characters are distinct and their little voices speaks sense and maturity. The beautiful prose and compelling story-telling of DeStefano also contributed a lot to make this book so amazing and awesome. Her depiction of things were wonderfully done. She treated sensitive topics, like death and suicide, fairly and echoes her thoughts (through her characters) that I found meaningful and good to be pondered on. Some back stories of the ghosts Pram met are also good addition to the story. I understand them better and made the story more fascinating. There are no words to describe how much I love this book. Pram is delightful. Lauren's writing is flawless. It took me back to the first time I read A Little Princess or The Secret Garden. Basically if you like Roald Dahl and Frances Hodgson Burnett (meaning, if you are human), you will love this. read in 6 hours. so lyrical and beautiful and wow, surprisingly haunting. I always forget that Lauren DeStefano is such a great storyteller, but then she comes back with yet another masterpiece. congrats again, dear! you're a writing genius. A charming tale that doesn't shy away from its darker themes. Pram (short for pragmatic) is an orphaned girl being raised by her two maiden aunts in a home for the elderly. The aunts hope that Pram will live up to her name, unlike her late mother, who killed herself before Pram was born. Little do the aunts know that Pram's unusual circumstances have given her the ability to talk to ghosts. Her best friend is a ghost named Felix, who hangs out down by the pond. But when Pram belatedly starts school A charming tale that doesn't shy away from its darker themes. Lauren DeStefano MIDDLE GRADE!!! Count me in! Eleven year old (well 11 years and 26 days old) Pram Bellamy has always been able to see two worlds—the living and the dead. In fact, Felix, her best friend is a ghost. She’s more comfortable and happy with the dead. When a boy from school stirs up questions and trouble with the other side, Pram soon learns just how powerful the in-between world can be. Her new friend, Clarence Blue, lost his mother a year ago, but the grief is still so fresh and unhealed. Pram could see how much he was hurting. He was hiding from the world—so numb and alone in his pain. That is until Pram steals his sit at school. The two become friends on the spot! A sweet friendship filled with understanding, fun and blushes. For me, a few too many blushes and hints of future romance. But still very cute. One day Pram and Clarence visit a spiritualist in town named Lady Savant, who can supposedly communicate with the dead. Clarence wants answers and closure from is Mom, but finds danger and darkness instead. It’s so easy to get lost in this world and the next. So easy to lose yourself in the dark. Can Clarence and Pram find their way through Lady Savant’s darkness and tricks? Ms. DeStefano has a wonderful way with the creeps and chills. Shadows, whispers, wind, and loss crawl over the pages and down my spine. A very spooky mood! But this story holds hope as well. Friendships form. Love is said and seen. Comfort, memories, communication and bravery all come out to play and maybe save the day. I do wish we got more of Felix in the second half of the book though. He felt a little left out or lost to me at the end. Perhaps we’ll see more of Felix in the next book. I hope so! I deliberately left a lot of detail out of this review because this story deserves to be experienced by the reader. Every shock and detail needs to be discovered by—YOU! Go meet Pram and her world. This was recommend to me by my dear GR friend Lola ! Click on her name to see her review. I knew that after reading Lola's review and the synposis I knew that I had to read it! I love ghost stories and middle grade. It was the perfect mix. When Pram was born she was dead. But because the doctors didn't believe that they were able to save her. Her mother died shortly after. Due to her near death experience Pram has been able to see ghosts since she was 5 years old. Her best friend Felix is a ghost who is always by the pond near her house. Her aunts (her mothers older sisters) do not believe that she can see ghosts. They assumed that Felix was an imaginary friend. Pram is a very strange child. Her aunts fear that no one will like her so they do their best to keep her with them. Until one day the teacher at the public school in her town insists that Pram go to school like a normal girl instead of being home schooled. While her aunts don't agree with this they don't have a choice and let Pram go. Upon her first day she meets a boy whose name is Clarence. The two quickly become friends after realizing that both of their mothers are dead. They seem to find comfort in each other. After a week of being friends Clarence reveals that his mother passed away last November. He believes that his house is being haunted by her. Objects are moved and every morning he wakes up to his curtains open. Which his mother used to do every morning to wake him up. He suggests that the two of them go to see a spiritualist Lady Savant. Pram believes that Lady Savant is a fake but goes long with it for Clarence. When they reach there Lady Savant pointedly asks Pram whether her mother died on purpose and whether or not her mother regrets anything. Pram replies no. After the show Clarence is upset because he thought Lady Savant was talking about his mother. He decides to look for more spiritualist's in hopes of finding his mothers ghost. It is revealed that Pram really wants to find her father. She has all these letters from him to her mother and she truly believes that because her mother passed away he doesn't know of her existence. Pram, Felix, and Clarence set off to find him. This was a really sweet story! I loved how their was a large emphasis on friendship and family. The authors writing style suited the story. It gave it that eerie atmosphere. It was slightly creepy but not to the point that I was scared out of my mind. There was a hint of romance between Pram and Clarence but it didn't take away from the plot. Pram was such a delight to read about. While she is a bit strange she was also intelligent, sweet, and would do anything to help her friends and family. I found it surprising that she was able to empathize with Lady Savant. I don't think I would've been able to do so. The spirit world and the ghosts were interesting to read about. Felix can create illusions with the clouds and unlike most ghosts I have read about he doesn't remember his life before. The plot is original and I have never read anything like it! This was my first time reading MG and it set the bar pretty high. Pram, Clarence, and Felix are all very interesting characters. Pram is fantastic. She's inquisitive, but sensible. And while that could be boring, Pram is anything but. It was fun being in her head. The story is unique and the plot kept me captivated. I don't want to say too much, because it could take away from the reading experience, but the visual this book provides is phenomenal. All in all, it was a quick read and I can't wai This was my first time reading MG and it set the bar pretty high. All in all, it was a quick read and I can't wait to see what the other books bring. Pram's mother has died at her birth and her spinster aunts have raised her away from the world in their retirement home. Her only friend is Felix, a ghost boy who meets her daily at the pond behind the house. When the school district insists that she go to a "real" school instead of being homeschooled, her aunts fear that people will not be friendly to their beloved niece. She meets and makes a friend on her very first day. Clarence has lost his mother, just like Pram, and it has been a daily st Pram's mother has died at her birth and her spinster aunts have raised her away from the world in their retirement home. Her only friend is Felix, a ghost boy who meets her daily at the pond behind the house. When the school district insists that she go to a "real" school instead of being homeschooled, her aunts fear that people will not be friendly to their beloved niece. She meets and makes a friend on her very first day. Clarence has lost his mother, just like Pram, and it has been a daily struggle to survive. He feels like no one understands his grief until he meets Pram. As Pram begins to trust Clarence, she lets him in on her secret life with ghosts. Clarence really wants to find his mother's spirit and after much searching they find a traveling psychic who immediately latches on to Pram's gift. Lady Savant is quite strange and wants more from Pram than she wants to give. I can't go any further into details because that would spoil this wonderful tale for everyone. This story will be once of your favorites and it is just perfectly done as a ghost tale. I am so glad I just noticed that this is the first in a series. I can't wait! Suspenseful and luscious story about a girl who lives on the border between life and death. Tucked away from the world by her protective aunts, with only ghosts for company, Pram has grown up strange, but intelligent and, as her name indicates, pragmatic. She is an utterly engaging main character, as are the people, dead and alive, who surround her. Although DeStefano's writing it spare, and the book is slim, it's somehow also a very lush and descriptive book that had me instantly picturing ever Suspenseful and luscious story about a girl who lives on the border between life and death. Tucked away from the world by her protective aunts, with only ghosts for company, Pram has grown up strange, but intelligent and, as her name indicates, pragmatic. She is an utterly engaging main character, as are the people, dead and alive, who surround her. Although DeStefano's writing it spare, and the book is slim, it's somehow also a very lush and descriptive book that had me instantly picturing every curlicue on the old-fashioned wallpaper and every knifelike pleat of Pram's plaid jumper. I got a copy of this book through NetGalley to review. Previous to reading this book I had read DeStefano’s Chemical Garden series which I really enjoyed. This book is written in DeStefano’s beautiful writing style and is mostly a ghost story. Pram was dead before she was born. Her mother committed suicide while she was still pregnant with Pram, but the doctors were able to revive Pram. Now Pram lives with her aunts and has the unique ability to see ghosts. In fact her best friend is a boy named I got a copy of this book through NetGalley to review. Previous to reading this book I had read DeStefano’s Chemical Garden series which I really enjoyed. This book is written in DeStefano’s beautiful writing style and is mostly a ghost story. Pram was dead before she was born. Her mother committed suicide while she was still pregnant with Pram, but the doctors were able to revive Pram. Now Pram lives with her aunts and has the unique ability to see ghosts. In fact her best friend is a boy named Felix. Then Pram’s aunts decide she needs to go to school and while there she meets the quiet Clarence whose mother has just died. Clarence can sense that Pram is special and asks her to help him search for a way to talk to his mother’s ghost. Their search leads them to a spiritualist named Lady Savant. The Lady Savant promises to help, but she knows the true power Pram has and what the Lady Savant wants to do with Pram is scarier than any ghost could be. This is a middle grade novel that deals a lot with death. So just a heads up there is discussion of suicide, depression, madness, and (of course) death throughout. DeStefano explains in the foreword that she wrote this book to help one of her young nieces (I think it was a niece) deal with the death of a loved one. There were some elements of this book that reminded me a bit of The Graveyard Book by Neil Gaiman. Pram (whose full name is Pragmatic) definitely reflects her namesake. She is very intelligent and quickly realizes that she is the only one who sees ghosts, she knows it’s not normal and knows that she needs to be careful or people will think she is crazy. Meeting Clarence is a relief for Pram because he is so very interested in tracking down ghosts that he sees Pram as special and interesting. I absolutely adored the friendship between Pram and Clarence; they are so kind and understanding and supportive of each other. They both need each other so badly and their friendship is so important. Clarence is desperate to find his mother’s ghost and Pram is desperate to figure out where her father is. Felix is a wonderful character as well and adds an interesting twist to the story. He’s a young boy who doesn’t want to remember his life and that’s an interesting thought. Maybe sometimes these ghosts of Pram’s are happier as ghosts than they ever were alive, which is sad but thought-provoking. This is both a story about coming of age and about friendship. At the beginning of the book Pram is constantly trying to find where she belongs, but as the story continues she finds out maybe she’s been searching too hard. There are some parts of the story that might be a bit scary for younger children in the middle grade age set. The idea of a parent killing themselves can be a shocking one for some kids. The fact that Pram is kidnapped and hurt is also a bit scary. Overall I really enjoyed this book, it was a sweet ghost story. It’s a quick read and has some wonderful discussion on friendship as well as an excellent coming of age story. I loved the ghosts and Pram’s power and am excited to see how Pram uses her developing powers in future books. I would definitely recommend to those who love bittersweet ghost stories. 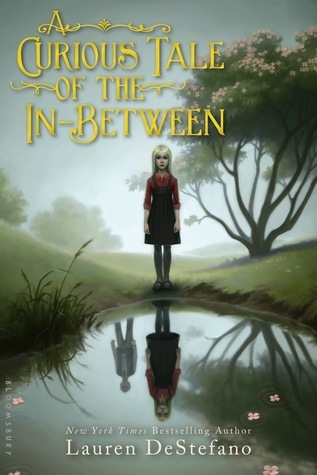 A Curious Tale of In-Between is a very special middle grade novel. I’d go so far to say it’s unlike any middle grade novel I’ve read before just because of the writing style. This book is filled with a lot of dark undertones and a very gloomy atmosphere yet the book is also middle grade because the main character, Pram, is only 11. Despite her maturity and intelligence, Pram has an innocence to her which makes her all the more endearing and fun to read about. She is a young girl trying to find a place where she feels she belongs. She has been seen as odd her whole life, her best friend is a ghost and she feels unwanted. She feels she killed her mother and she wants to find her father. Pram wants to find a place where her oddness doesn’t cast her out but rather makes her feel like she belongs. When her aunts send her to school, she meets a boy who has suffered a loss and wants to hide in the shadows as well. They soon become close friends and help each other seek out the closure they need. Unfortunately, this leads to them being kidnapped by a woman who has other plans for Pram and her ability to see ghosts. That’s when things take a darker turn. I actually hadn’t expected the novel to take such a turn but it did and that’s when the book actually became scary. Don’t get me wrong, this isn’t really meant to be a horror, it’s just when you see a little, innocent kid go through such a horrifying ordeal, you feel terrified and hope that she is okay! I love how things turn out in this book. It’s so adorable and cute and it makes me want to re-read the entire book so I can just live through those emotions again. This is an adorable little middle grade novel that features fantastic characters and important themes of finding yourself. I’d definitely recommend it to people looking for a refreshing middle grade novel that will blow their socks. This is one of the rare occasions when a three year old review actually pretty well encompasses my thoughts on the book upon a reread. This is still one of the better middle grades I've read. While I would bring my rating down a bit due to the heavy-handed telling not showing at times, I think this is one of the creepier middle grades out there. It has strong themes of friendship and acceptance and a leading lady that is a great heroine for young readers to look up to. Recommended for young and old readers alike! It's a terribly sad day when you come to realize you've begun to question whether you've grown out of middle grade books. You pick them up and there's no magic anymore, or it feels immature. The plot seems sillier than you remember, and you wonder if it's even worth it to pick middle grade books up anymore. And then you come across a gem like this one. This book completely took me by surprise. I nearly took this off my tbr. I've never read Lauren DeStefano, and I know her other series' have pretty mixed reviews. That, combined with that this looked a very basic middle grade, I expected this would be a 3, maybe 3.5 at best. I was very, very wrong, as I ended up rating this 4 1/2 stars. This tiny little book was quite honestly beautiful. I'm not sure what it is about it that makes it so. Maybe the writing, maybe the characters, maybe it was just one of those books that clicks with certain readers. Lauren DeStefano's writing style fit this story perfectly. It was somehow simple and lyrical, and it flowed right along with the story in a way that made this compulsively readable. The story itself was very poignant. Pram, a young girl, can see ghosts. Her mother is dead, and she's never met her father. She struggles with feeling accepted, but what I loved about this book was seeing Pram discover friendship. That's part of the reason why this story resonated with me. Pram's friendship with Felix and Clarence was so sweet. The characters were very well written, and I found myself empathizing with Pram and Clarence almost as soon as they were introduced. I'm still not a hundred percent sure what the setting even was, but I loved it. It was perfect for the story, and it created such a great atmosphere. The dialogue felt a little old timey, which matched the small town setting. This book didn't go where I was expecting at all. Halfway through I thought I had this pegged as a bittersweet story about Pram finding acceptance and friendship, which would have been fine, but all of a sudden there's a bunch of mystery and action! The stakes actually felt high, which is uncommon in children's books. This book in no way shies away from the darker side, which actually may have been scary for children reading this. It was also quite easy to visualize, which makes me think this would translate well into film. This is also supposed to be a series, and I'm really looking forward to watching Pram grow up through the books. A Curious Tale of the In-Between is Lauren DeStefano’s first middle grade book, and I certainly hope it won’t be the last. This book is absolutely wonderful, enchanting, and full of life – despite the fact that Pram can see ghosts. I was drawn into Pram’s world from page one and read this one quickly over the course of two days (only because I had to work). It reads quickly and will keep you completely captivated the whole time. Pram (short for Pragmatic – what a great name) is special – she can A Curious Tale of the In-Between is Lauren DeStefano’s first middle grade book, and I certainly hope it won’t be the last. This book is absolutely wonderful, enchanting, and full of life – despite the fact that Pram can see ghosts. I was drawn into Pram’s world from page one and read this one quickly over the course of two days (only because I had to work). It reads quickly and will keep you completely captivated the whole time. Pram (short for Pragmatic – what a great name) is special – she can see ghosts. She was born dead and brought back to life so she hovers somewhere in that in-between place, which gives Pram her ability. She is anything but ordinary, which you can see as you read the book. She’s smart and curious but practical (hence the name). I want to follow her on more journeys – give me more Pram! Pram’s friends, Felix – a ghost – and Clarence – not a ghost, are just as wonderful. I wanted to reach into the book and hug Felix with everything I had. All of the friendships in this one were sweet and supportive. Honestly, the best part of The Curious Tale of the In-Between is the fact that it’s…well, it’s dark. It’s not your average MG book. It has some really tough topics brought up (suicide, depression, death) and Pram and her friends are put into some harsh situations. But DeStefano realizes that kids can deal with these things and she doesn’t try to lighten it up or beat around the bush. It was refreshing to read, and I know a lot of kids reading this book will appreciate (and even need) that. The real world can be scary and sad, and DeStefano doesn’t shy away from those harsh realities. As the summary states, this middle-grade debut surely is evocative. I can't continue that note even further until you all go out and pick up this gothic read. DeStefano's mind and world created is so dark and steampunk-ish. All I picture is grey skies, characters dressed up in bonnets and pretty dresses and did I mention grey skies? It's such a gloomy read filled with grief and discovering who you are, but at the same This review can also be found on A Thousand Lives Lived, check it out for more! As the summary states, this middle-grade debut surely is evocative. I can't continue that note even further until you all go out and pick up this gothic read. DeStefano's mind and world created is so dark and steampunk-ish. All I picture is grey skies, characters dressed up in bonnets and pretty dresses and did I mention grey skies? It's such a gloomy read filled with grief and discovering who you are, but at the same time it gives readers all of the feels. Any kid would enjoy this book somehow and it's absolutely recommended by me, myself, and I. This story is about Pram Bellamy, short for Pragmatic, an attribute that Pram's mother didn't have at all. Pram's an orphan, as her mother died while giving birth and her father's completely out of the picture as he doesn't even know that Pram exists. Did I mention that she sees ghosts? Her closest friend is Felix, who's a ghost and is the only one who she can talk to. She lives with her two aunts and when it's time for her to actually start attending school (her aunts taught her for a while), she meets Clarence, who also has lost his mom in an accident and together they head off to discover answers from a spiritualist. Things like this can surely happen to people. That's one of the reasons why I enjoyed this so much, even though it contains lots and lots of fantasy. A ghost killing someone and chasing you? That obviously isn't bound to happen in reality, but some of the book's events seems so real. FRIENDSHIP? Check. A NICE FAMILY? Check. It's complete beauty. Pram and Clarence were so freaking adorable. I bet that they'll end up being boyfriend-and-girlfriend one day, or as the series continues. *hopes* I am in full support of boy-girl friendships, especially in literature because we NEVER see enough of that. Fighting in the spirit world and helping each other out? That's cuter than watching two brown bears play fighting. They were always there for each other and now I'm squealing. Damn. I didn't like Pram's character, sadly. I bet that you now know what's the special ingredient that brought my rating down, and it was that. I usually never have issues with middle-grade heroines/heroes, but in this case, she was disappointing. Too naïve, too gullible, I don't know. She fought for her answers, which was nice, but we didn't get to see that special something coming out of her, you know? But in that case, I'm letting you know that the writing is so descriptive, slow but imaginative. No fantasy author has ever done it that way, I can tell you. The title of this book makes so much sense now that I've read the story. It speaks to readers, actually. This certainly is the best middle-grade read I've read this year, next to Fuzzy Mud and The Isle of the Lost, and I just can't wait for the next book in the Pram series. I'll fight a ghost to grab a copy of the sequel. I'M JOKING, I'd never do what the brave characters had to go through now that I think about it. Let me go read a cutesy contemporary because I just can't go without thinking about this spooky read. CHILDREN, GO AND LINE UP FOR THIS BOOK WHEN SEPTEMBER 1ST COMES. I don't normally read middle grade but I won an ARC copy and both the title and the cover of A Curious Tale of the In-Between drew me in so I read it. I made the right decision. The story was intriguing and the characters were fabulous. Pram is an extraordinary girl in every sense. Yes that means she can see ghosts. Growing up she has learned it's not a normal ability so she keeps it to herself. I love how pure her heart is. She's only 11 years old but she's already always thinking of others. Her I don't normally read middle grade but I won an ARC copy and both the title and the cover of A Curious Tale of the In-Between drew me in so I read it. I made the right decision. The story was intriguing and the characters were fabulous. Pram is an extraordinary girl in every sense. Yes that means she can see ghosts. Growing up she has learned it's not a normal ability so she keeps it to herself. I love how pure her heart is. She's only 11 years old but she's already always thinking of others. Her aunts are uncomfortable when she talks about ghosts so she keeps it to a minimum. When her new friend wanted to look for his mother's spirit she helps him. Pram is a sweet girl that is kind and courageous. Felix and Clarence both cared deeply for Pram. Both boys protected her in their own way. Being a ghost did not stop Felix at all. He is a very comical ghost. Clarence was ever the very well-mannered gentleman (gentleboy?). He was genuine in every way. Pram's very lucky to have these two by her side. I wasn't expecting the book to have such a dark side but I had shivers learning the terrible truth behind Lady Savant's actions. I wouldn't say she was all bad though. If not for her, Pram wouldn't have come to understand she's not strange at all, she's special. This is by far one of the best MGs I have read to date. The writing and the world Pram lives in is so captivating. I knew from the first few pages that I was going to have a hard time putting this one down! SO I curled up and read this one start to finish, which was how it was meant to devoured! Pram has got to be one of the brightest, most intelligent, bravest and fiercest 11 year olds out there. It was easy to fall in love with her character and the people she cared for. Felix and Clarence are This is by far one of the best MGs I have read to date. The writing and the world Pram lives in is so captivating. I knew from the first few pages that I was going to have a hard time putting this one down! SO I curled up and read this one start to finish, which was how it was meant to devoured! Pram has got to be one of the brightest, most intelligent, bravest and fiercest 11 year olds out there. It was easy to fall in love with her character and the people she cared for. Felix and Clarence are such great friends and so fiercely protective of Pram -even though she definitely can hold her own – which I absolutely loved. Their friendships were portrayed so well and is one of the best things about this book. I really love seeing strong friendships in books, and friendships that build the characters up and make them stronger. This entire book has a really magical feel to it also. It’s hard to explain, but I felt liked it pulled me back to feeling like a kid again where any and every adventure is possible. It gave me the feeling that Harry Potter does every time I pick it up, it’s just magical. I think sometimes it’s really hard for me to get that feeling when reading a MG, but this one just blew me away. I liked the concepts and plot of this book, but I think I expected more from it than it had to give. It certainly isn't original, in fact it almost copies stories like "The Tale of the Jagged Sign" from the 1990's show Are You Afraid of the Dark? or the graphic novel Anya's Ghost. Pram herself was boring, and without her ability to talk to ghosts she's just a girl with nothing interesting about her. Her best friend, a spirit named Felix, is a better-written character than Pram, but still not tha I liked the concepts and plot of this book, but I think I expected more from it than it had to give. It certainly isn't original, in fact it almost copies stories like "The Tale of the Jagged Sign" from the 1990's show Are You Afraid of the Dark? or the graphic novel Anya's Ghost. Pram herself was boring, and without her ability to talk to ghosts she's just a girl with nothing interesting about her. Her best friend, a spirit named Felix, is a better-written character than Pram, but still not that great. This is, alas, going to be short: for some unknown reason I've developed a mighty pain in the neck (Pam remarked sympathetically that it made a change for me to have one rather than be one), and it's making typing quite a chore. The book deserves a longer account, but even without the neck pain I'm up against the wall, workwise, for the next few days. Pram, an odd little girl living with her elderly aunts, is haunted by the fact that her mother killed herself just before giving birth to Pram, whi This is, alas, going to be short: for some unknown reason I've developed a mighty pain in the neck (Pam remarked sympathetically that it made a change for me to have one rather than be one), and it's making typing quite a chore. The book deserves a longer account, but even without the neck pain I'm up against the wall, workwise, for the next few days. Pram, an odd little girl living with her elderly aunts, is haunted by the fact that her mother killed herself just before giving birth to Pram, while her father, a mariner, is somewhere on the high seas with apparently no interest in his daughter. Yet there are compensations in Pram's life -- one being that she can see and converse with ghosts. Her best friend Felix, in fact, is a ghost; he "lives" around the pool and tree on her aunts' estate. When finally her overprotective aunts let her go to school, Pram meets and is immediately enamored of Clarence Blue. The feeling's mutual. When Clarence says he wants to try to get in contact with the spirit of his dead mother, Pram willingly goes along with him to seances. It's through this goodheartedness that she finds herself ensnared by the evil spirit medium Lady Savant, who recognizes Pram at once for what she is, and determines to steal her soul . . . I picked up the ARC of this book at BookExpo recently purely because of the cover artwork, which is fabulous. (Oddly, the ARC doesn't credit the artist. Luckily Bloomsbury's Lizzy Mason was able to tell me that the cover was done by Kevin Keele, more of whose art I must now seek out.) Of course, there are plenty of great covers on bad books, but that isn't the case here. He watched her go. Her ponytail flew behind her like a kite made from a piece of sun. Clarence offered her a napkin. He didn't tell her about the raspberry smudge on her nose, partly to be polite, but mostly because he found it charming.